Growing up in the ‘80s and ‘90s, there was one thing I could always count on: the mall. And when my friends and I wanted to get together, we usually hit up the mall. After sitting and eating in the food court, we would walk up and down each side of the mall, mocking each other’s alleged sense of style and peering at things we couldn’t afford. An odd benefit of being a mall rat in those days was you also saw things you may not normally have been interested in. Back then we had a store called The Nature Company. I would look at the different stones and mishmash of items and think, “Maybe this will be on my Christmas list.” Shucks, I remember wanting a desktop fountain even though I didn’t have a desk. The mall was a way of exploring the world and what it had to offer without paying the cost of museum admission. These days, however, I fear the mall, my own personal zocalo, is endangered. Online retailing giant Amazon.com has become everyone’s go-to for gifts and the like. It makes sense after all, with our hectic lifestyles and busy schedules, that we would turn to whatever is most convenient. By the time I get home from work, I’m too tired to round up the kids to visit the stores. But what if what is more convenient is actually stifling us? For example, when I visit Amazon.com, I purposely go straight to something I already had or have researched. I know I want the Calico Critters House for my daughter so I search that specific term and within a few minutes purchase the item for her. There’s no wasting time, right? The problem is there isn’t any browsing or discovering a new interest by chance. There’s also no daydreaming by my children as they walk down each aisle. There’s no element of surprise. Toys R Us, which filed for bankruptcy in September, is one of those places that needs us to browse. I visited the store recently and spoke with an associate, who said he didn’t think his job was really in jeopardy. “If we go down, all of these guys suffer, too,” he said, gesturing to toys that included Barbie, LEGO, Pokemon figures and mechanical contraptions. I wish I were more optimistic, but I fear convenience has gotten the better of us. The other thing we lose out on is human communication. When you’re waiting in line, you sometimes talk to fellow shoppers. In fact, last year I met Mayor Mark Arapostathis’s mom at Macy’s! I would never get to do something like that dropping an item into my online shopping cart. 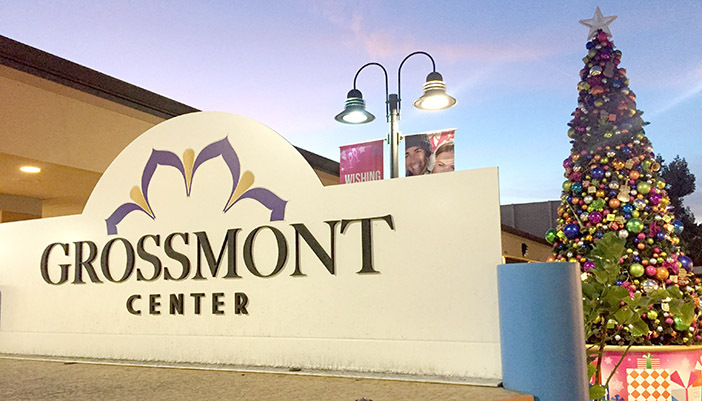 This time around I am determined to support Grossmont Shopping Center during the holidays. I am going to devote a little bit of time to browsing the aisles and choosing gifts I think befit my family and friends. Even better, Grossmont has started to post signs around its parking lot to encourage shoppers to get their steps in for better health, so there’s that as well. While I know the mall has its shortcomings — I would like a Gap, a Banana Republic and a few other trendier stores — it is still my local gathering place. Consider joining me at Grossmont for the holidays this year even if it’s only to get your steps in and chow down at the food court. Who knows, you may just find something you never knew you wanted.